This set contains 63 drawings of different types of trees. Species included in this collection: apple, peach, pear, plum, cherry, ash-leaved maple, ash, beech, butternut, cedar of lebanon, cork oak, elm, bamboo, date palm, fan palm, feather palm, fig tree, hawthorn, holly, hornbeam, horse-chestnut, japan sophora, magnolia, mountain ash, mulberry, oak, olive tree, poplar, lombardy poplar, quince, robinia pseudo acacia, pine, fir, spruce, larch, sycamore maple, cypress, juniper, turkish hazel, walnut, willow, birch, hickory, buckeye, yew and others. 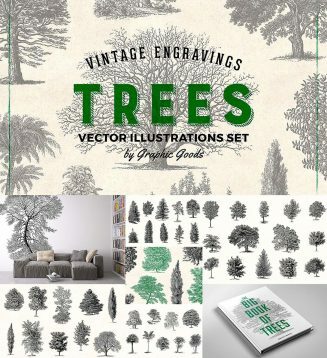 These illustrations will be perfect for wide variety of projects, for example, logos and branding, fabric and apparel design, patterns, packaging, stationery etc. It’s also very suitable for decoupage and scrapbooking. Tags: Antique, birch, engraving, forest, maple, oak, old print, pine, tree, vintage engraving, vintage illustration, willow.